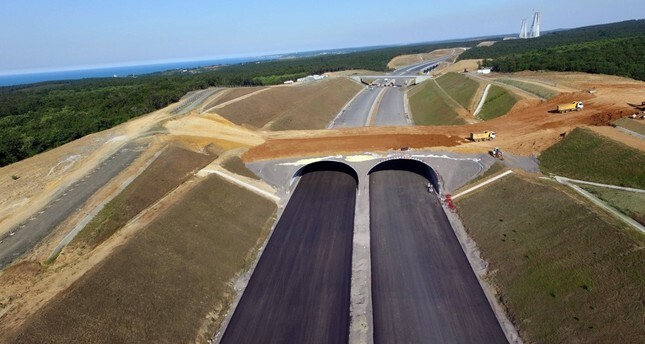 Amid a construction boom, Turkey strives to preserve wildlife facing risks due to the destruction of their habitats for new construction projects, while the Forestry and Water Affairs Ministry announced that the country's first wildlife crossing will soon be completed. The project on the Northern Marmara Highway traversing Istanbul's northern areas near the Black Sea, aims to merge the habitat bisected by the highway that will be connected to Istanbul's third bridge, which is scheduled to open later this month. The crossing, a wooded area on two 22-meter-wide concrete tubes, will cost about TL 12 million ($4.09 million) and barbed wire will be erected on paths leading to the crossing to divert wild animals like boar and foxes away from the busy highway. Forestry and Water Affairs Minister Veysel Eroğlu said the crossing will eliminate problems concerning feeding, mating and shelter for wild animals and will also prevent road kill and traffic accidents. Turkey is home to three biodiversity hotspots and has diverse endemic species. Authorities are planning more crossings as part of a nationwide project. An 82-kilometer-long wildlife corridor is planned for the Black Sea region, which is home to lush forests, to conserve over 70,383 acres. Officials from the Forestry and Water Affairs Ministry say that Turkey's shrinking forests are the main reason behind the human-wildlife conflict as natural habitats quickly disappear and cause a lack of food. In Istanbul, several wild boar were spotted last year on the shores of the Bosporus probably searching for food after the forests in the north of the city were cut down. The Black Sea corridor will stretch further east and will provide an enlarged wildlife habitat for animals in the Sarıkamış Forest, Allahüekber Mountains National Park and Borjomi National Park in neighboring Georgia.